One of my good friends is getting married and she has been sharing her wedding planning with me. It seems like country weddings are fairly popular now days and I've seen a few country flower arrangements. So today I decided to try making a sassy one. For the vases I re-used a classico pasta sauce jar and yoga nectar bottle (imported from Italy). 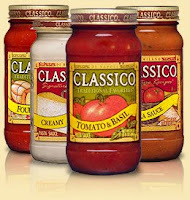 I love the classico pasta jars because they have writing on the glass and it gives the jar that extra especial country look. I got the inspiration to use the yoga fruit nectar bottle while I was having coffee at Da Capo Cafe as they use them for coffee cream. They look super cute filled with cream, makes them look like tiny vintage milk bottles. I remember when I was little in Cuba we got milk in glass bottles and they look just like them except miniature sized. In the arrangements you will find mums, green trick, curly willow and assorted grass. I like to remove all the leaves from the stems to give it a clean look in the jar. I also leave my vases empty (no water) when adding the flowers. I find that when the vases are full of water it makes it harder to put the flowers and accessories in. In the big arrangement I put three mums together and wrapped the stems in grass using doubled sided tape. I added the green trick and a piece of curly willow. Then I finished it with three pieces of grass curled around. Put three mums together, remove all the leaves from the stem. Use double sided tape, then wrap with grass. I prepared my water in a watering can with the flower crystals that the flowers came with. Then I use the watering can to add the water to the vases in a slow steady pace. Your arrangement should not shift while putting the water in. I made two small arrangements using the small green mums and the yoga fruit nectar bottles as accents. These look great around the bigger arrangement or on their own around the house. I loved them by the sink in the washroom. These sassy country inspired arrangements would look great around the house, in the kitchen, dinning table, in the living room, in the bedroom or even on a patio table. I picture drinking a nice hot or ice tea out on the patio while surrounded with these beautiful flowers. I use up all my left over flowers and accessories. Here is what I did with the left overs.